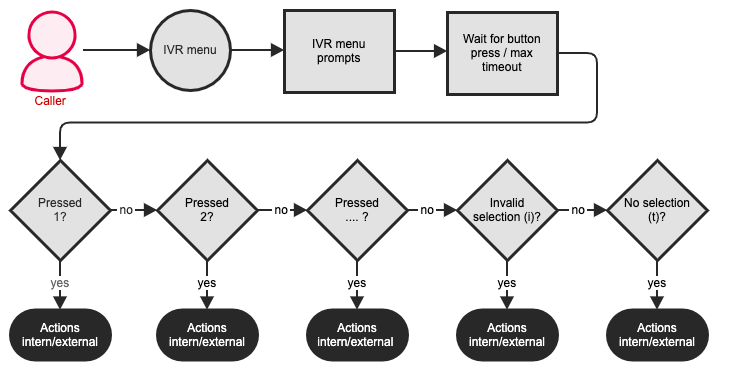 IVRs (Interactive Voice Response Menus) are used to route a caller through the phone system by selecting menu options via their telephone keypad. For example, 50 % of all calls to the central switchboard might actually be intended for the marketing or support department. In this case, using an IVR to direct calls to the relevant department directly could be beneficial in taking some load of off the central switchboard. After the announcement, the system waits for the user to press a key for as long for a specified amount of time which you can set using the timeout function in the IVR menu. In our experience, a 5 second timeout is usually enough. If the caller presses a button with a corresponding entry, the associated actions will then be carried out. If the caller presses a button with no corresponding entry, the entry with the special number i (as in Invalid) is called. Actions associated with this number should make the caller aware of the invalid key that was pressed and should offer the IVR menu to the caller again. If the caller doesn’t press any button during the timeout, the entry with the special number t (as in Timeout) is called. Actions associated with this number should make the caller aware that no key was pressed and should offer the IVR menu to the caller again or the caller should be put through to the central office. In many scenarios it makes sense to ask several questions in a row to put callers through to their desired destination. Firstly, you could ask the callers if they wished to be put through to the support department and then ask for a more specific support category (problems concering Windows, Linux, etc.) to select the appropriate staff member they can then talk to. To create multi-stage IVRs, you can create any number of IVRs and forward calls from one IVR to another. This way, an arbitrary number of IVRs can be implemented. Preferably, you should not create nested IVRs that are deeper than two levels. Higher complexity leads to confusion and this is usually frustrating for the caller and therefore is not desirable. Title The title of the IVR menu. Answer channel Usually, the channel is answered immediately if there is hold music to be played or an announcement to be made. This option allows you to configure a delay (in milliseconds). In some cases, immediate answering of a call leads to the first syllable being skipped. The delay time mitigates this problem..
Timeout The time in seconds that pascom waits for the caller to press a key after playing the announcements. Extension The extension number for this IVR menu. Upstream prompt This announcement is played when the menu is entered and should contain text similar to “Press 1 to …, 2 for …, etc”. To learn how to record your own announcements, please see Custom Prompts and Music On Hold. button to create a new entry. Title General title for the entry. Number The key pressed by the caller. Valid keys are arbitrary numbers or sequences of numbers. Special numbers are t for timeout and i to signal that an invalid key was pressed (note that these two are characters and not numbers). To avoid overlapping keys either use single, double or triple digit combinations and avoid mixing these numbers. For each entry, corresponding actions must exist that are to be carried out if and when a certain button is pressed. button. Actions pertaining to the entry can be found in the Intern and Extern tabs.